The old man palm tree is sure to get lots of attention. I would plant it as a centerpiece in the front yard where passersby and visitors could get a good look at its unique beard. The beard is the source of its common name, as you may have guessed. An easy tree to keep that generally doesn’t get too tall in landscapes making it a perfect choice for a front yard display. This palm has circular fan leaves that are an emerald green on top and a grayish/silvery green on the underside. The leaves can get anywhere from 4-6 feet across. They are deeply divided almost right into the center but are stiff enough to not be droopy. The trunk of the old man palm is what makes them so special. The thick mat of fibers can be a light brown to gray or even a golden yellow color. They are attached right to the trunk hiding the old leaf bases. The tree appears to be growing a beard. They are quite long and can actually be soft to the touch. The beard can get over a foot thick and will stay on the trunk for many, many years. Only some very old specimens will be without it, then the trunk is only about 6-8 inches thick. You’ll have to watch if you have a lot of humidity in your area. Too much moisture in the air combined with strong winds can damage the beard. Consider planting in a place protected from the wind if your area is prone to high humidity. This old man will produce spiky flower sprays up to five feet long emerging right out of the crown. The flowers of both sexes on the same tree will be a yellowish color. Once pollinated they will turn into a small fruit that is a light to darker purple almost black color when ripe. The trees can be grown from seed pretty easily and they usually germinate sometime in the first 3 months. 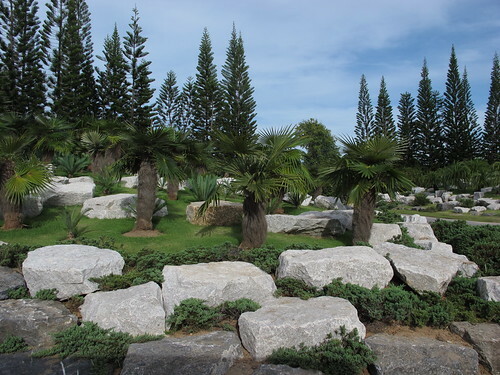 The old man palm is fairly easy to care for growing in any type of soil that is well drained. Originating in Cuba they are sub-tropical doing well to about the freeing point or slightly below. These trees are somewhat drought tolerant but will do better with regular water and fertilizer that contains Manganese. It sometimes will have show signs of a deficiency that is easily corrected with the proper fertilizer. It doesn’t have any other disease or pest concerns associated with it. For a palm tree, they are on the small side getting to 30 feet tall in the wild. Only maybe as tall as 15-20 feet in landscapes and 6-8 feet wide. Part shade is okay especially when they are young, but be sure to plant them so they will have exposure to full sun once they get older. 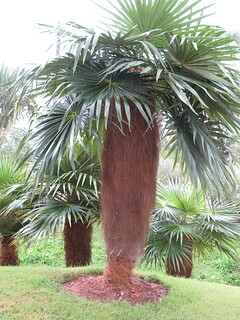 The old man palm grows at a slow to medium rate so it will do fine planted in a container for many years. Don’t forget to display this tree where you can appreciate the long beard up close. 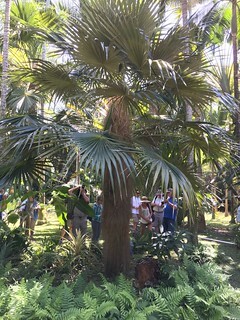 Small, medium, large and cold hardy palms provide a list of trees in each category. Best indoor palms has the easiest to grow in your home or office year round.